There are truly hundreds of powerful ideas I could share from my experience last week at the Radiology Society of North America (RSNA) conference in Chicago, but I believe the key message is this: it’s time for healthcare to stop designing patient environments with one arm tied behind its back. More literally, it’s time to stop treating very credible processes and tools like evidence-based design (EBD) and simulation modeling as optional assets at our disposal. If we’re truly committed to creating the best healthcare spaces for patients, these tools need to be integrated into everything we do. Otherwise, we’re leaving an element of guesswork in design efforts that doesn’t need to be there – and doesn’t guarantee desired performance and results. I was fortunate to present on this topic at last week’s RSNA conference and will share further insight later in this post, but to best understand the topics, it’s key to understand the conference. The RSNA event is not really a healthcare conference, but actually the largest clinical conference in the world. The RSNA, an international society of radiologists, medical physicists and other medical professionals with more than 54,000 members spanning 136 countries, hosts the event each year. The conference in Chicago draws an average of 55,000 people each year. It’s a massive week-long event full of captivating speakers and rich ideas. The RSNA keeps the conversation going throughout the year by publishing peer review journals that are globally respected as the reference for all things radiology. Embedded in these learning goals was a focus on elevating people’s understanding of the value of EBD. To illustrate its importance, I needed to speak deeply about the process of EBD which all begins with establishing a guiding principle to drive the design. 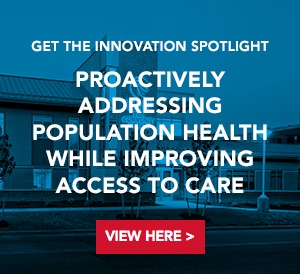 If you’re going to create or improve an outpatient facility, what are you trying to achieve? Are you designing for safety? Are you trying to reduce noise distractions? Once you have that guiding principle identified, you then need to do research on the topic to secure data. Then, interpret the research and apply it to the design. There are always insights to be gleaned from past studies that when strategically applied can improve outcomes. Creating EBD architecture is a simple and proven process, but we too often forego it for cost and deadlines. We need to do more to educate our clients and partners that EBD isn’t an optional tool – it’s the path to achieve their desired outcomes. Again, if we’re not using these tools, we’re not giving health design our best effort. Simulation modeling isn’t an add service, it’s a necessary step – and we need to help our clients understand the value. There was great focus on how we can improve our current methods to achieve better resolution, lower radiation and increase efficiency. Several presentations touched on the need to embrace patient centered care and 3D printing. Another key topic was the need to develop special mobile radiology tools for multi-purpose use. I’m particularly interested in this topic as it builds on an idea I presented on a year ago which looked at the end of inpatient imaging departments as we know them today and suggested a mobile “vertical” department where the patients don’t need to move. The ability to simultaneously correlate molecular and functional events with whole organ anatomy – which is unique to imaging – was a big point of discussion. Precision Medicine: This is “The holy Grail” for the radiology industry. It is about spotting disease earlier, being more predictive about where the disease will take place and marrying that with personalized therapies. Attending, speaking and learning at RSNA is always a thrill. It’s an important conference with key ideas for the future of healthcare and clinical outcomes. I’m already looking forward to next.